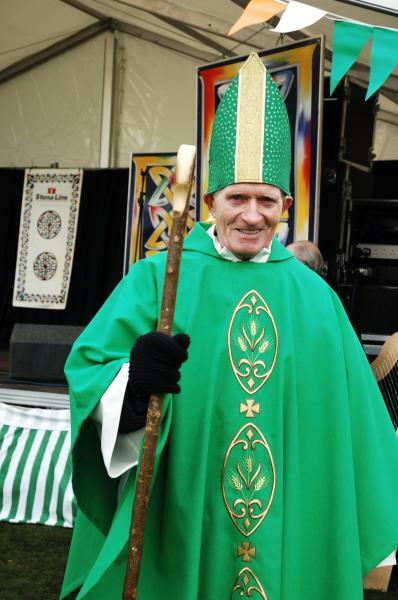 Mick - our own St Patrick who proudly led our Nottm St Patrick's Day Parades for 13 years from 2000 to 2012. Mick was a real gentleman his hall mark being 'generosity', a quiet man, a family man, a man who loved dancing. Born near Charlestown Co. Mayo he came to England in the 1950 and joined the Irish community of Nottingham, taking the lead, with a few others, to become one of the founding fathers of the Nottingham Irish Centre - Wilford Street. Mick had a farm at Trowell which had& an open door to anyone who called. He farmed sheep and cows as well as keeping a mock up Irish Cottage that was featured many years within the Parade. Mick carried his homeland and faith in his heart and brought it here to us all in Nottingham.